we are offering a qualitative range of Relay Interface Modules that has modularized structure, convenient for maintenance and displacement. The provided interface module is developed by utilizing contemporary technology and prime grade material following the industry defined standard. The offered interface module is applicable to be used in a host of industries. 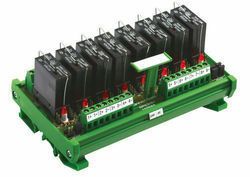 We offer this interface module in a wide range of specifications. Without Socket/With Socket.Without Fuse/With Fuse at Pole.Without Loop/Negative Loop/Positive Loop. Owing to our immense domain expertise and market knowledge, we are able to manufacture and supply our clients an excellent quality range of 4 Channel 4 Change Over Relay Module. Offered relay module is precisely manufactured by our experts using excellent quality raw material and advanced technology as per the set industry standards. Our clients can avail this relay module from us in various specifications as per their exact requirements. 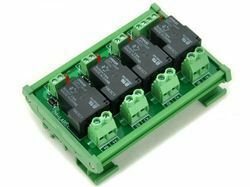 Fostered with a team of highly experienced professionals, we are offering our clients a superior quality array of 4 6 8 10 Channel Single Double Change Over Relay Module. Available in varied specifications as per the requirements of clients, this relay module is manufactured using high quality raw material and cutting-edge technology in adherence with the international quality standards. 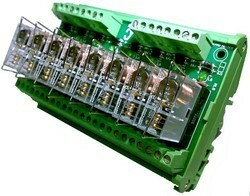 Our clients can avail this relay module from us at very nominal rates. Based on the expertise of experts, we are providing a faultless range of Relay Card. Increasing recognition of our offered range across the industry remains directly attributable to its superior service life and ruggedness. Designed from top-grade raw material, the offered product is hugely durable and guaranteed of its quality. Additionally, the quality controller rigorously tests the whole range upon various parameters of quality. Furthermore, Customer can avail this product from us at market leading rates. We are listed amongst one of the renowned organizations in the domain, engaged in offering 16 Channel Single C/O Relay Module. Our offered module is available from us in diverse specifications. This module is developed by using optimum quality material and advanced technology by our competent professionals. This module is rigorously tested on various parameters for delivering a defect free range. Customers can avail this module from us in a given time frame at affordable rates.